Setting a comic inside a post-apocalyptic world run by demons inside another mini-dimension run by a powerful overlord might seem like one of the strangest concepts for a superhero book, but it is the basis for the Inferno series which is tying into Secret Wars. The first issue was a solid introduction to this universe, where the X-Men patrol what is left of New York City against a demon horde, while the same horde led by Colossus’ sister does pretty much as they want inside their own domain. 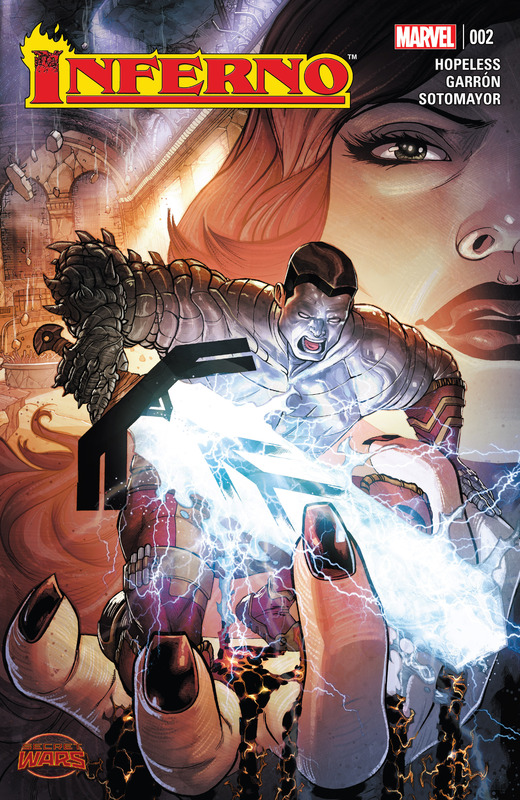 Once per year Colossus leads a strike team to try to rescue his sister, and the first issue focused on the most recent attempt to do so. Previous attempts resulted in tragedies of one kind or another, and this attempt seemed equally doomed from the onset. It should be said that even for someone following along that this setting is pretty weird and confusing. Domino and Colossus were separated and thrust into two different sub-plots involving the Goblin Queen, Madelyne Pryor. As the characters try to regain a stronger foothold, the development of the story takes some strange twists as the strike team is fractured and then almost reunited. Meanwhile Magik and Nightcrawler face off against each other, with Nightcrawler at a distinct disadvantage being her prisoner. There is a general lack of description in this issue, as the reader is seemingly supposed to let go of trying to make sense of what is happening in the interest of allowing the demon world to exist. While this is a bit of a letdown in terms of the pacing the issue is saved by the well written characters, as specifically the interaction between Colossus and Madelyne, and also between Domino and Madelyne’s son save this issue from going off the tracks. Heading into the next issue it would seem as though there is a stronger direction for this series, and while the setting is bizarre, that the creative team is making it work.